Please visit Junior Style London for the full post here. Lost in a world far from the dredges of an unforgiving New England winter, a restorative sojourn was a welcome reminder that spring’s rite of passage is within reach on our own shores. With wild abandon, we dance along a path of tangled tree roots to the calming rush of palm fronds. Finding ourselves in the company of lizards and bird-like insects, untethered we roam with the full intention of losing all inhibition along the way. The girls wear rich handwoven textiles from childrenswear brand Chotto Golpo and their adventures ensue with a nod to warmer days ahead. Nary a moment passes before their feet take on the lightness of Chotto Golpo’s handwoven Bengal Jamadi fabrics that move with elegance and fluidity. The brand’s spring collection strikes the perfect balance between vintage-inspired styling and modern-day ease of wear. The handwoven nature of these fabrics makes for delightfully soft textures in hues of saffron, crimson and indigo. With a few short weeks until the official mark of spring, thankfully our winter coat wearing days are numbered and soon we’ll be floating through our own city streets in the beautiful designs of Chotto Golpo. Elise and Mila’s dresses: Chotto Golpo. Click here to view the collection. For the full feature, please visit Junior Style London here. With fresh faces, we greet the world to celebrate its annual trip around the sun. This passage of time is but a day in our lives yet we pause for a moment to reminisce on much more than that. The girls and I piece together favourite memories from our year and reflect quietly on our woes. Our annual cleanse drives us forward with a hopeful spirit and a list of goals that feel both attainable and exciting. Refreshed energy has us reaching for the perfect accoutrement in this marvellous moment, and we welcome 2019 with a taste of fancy from American clothing brand, Maman & Moi. Daydreams abound as we look ahead to another year of adventures and friendships, beauty and growth. 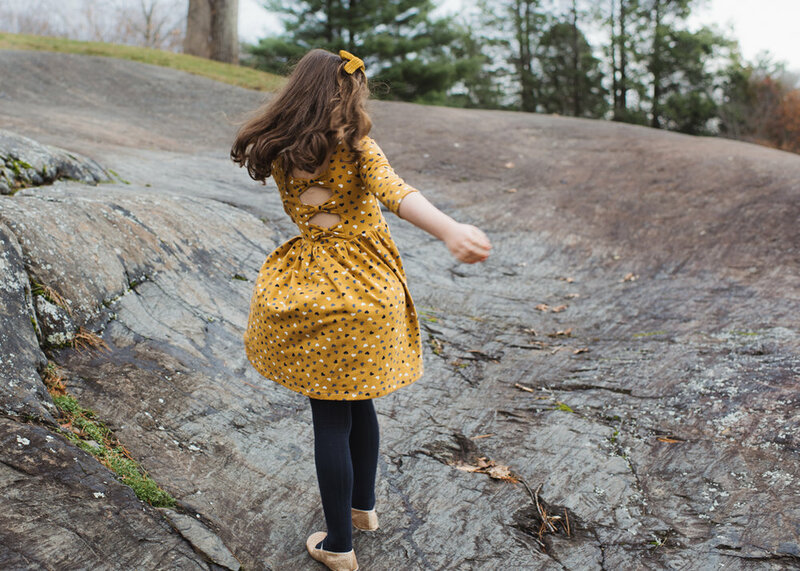 And while we may not yet know the culmination of our fantasies, we’re eager to begin anew in the lovely Charlotte dress from Maman et Moi. As with many of the timeless styles from this speciality brand of childrenswear, the possibilities for wear are as varied as our days. From ringing in a New Year to a dinner date with Daddy, our 2019 diary is budding with perfectly styled fun to be had. Elise and Mila’s dresses: Maman et Moi. View the Maman et Moi website here. For the full feature, visit Junior Style London here. There are few things we enjoy more than an afternoon rendezvous to explore the history of our area. A Victorian mansion once alive with grandiose parties and opulent decor is ours to peruse on this fine day. A child’s imagination opens my eyes to the fun that surely was had over a century ago. Set atop a hill, with its own natural rock formation playscape, our afternoon escape was a pleasant treat for all. Elise and Mila waft through the halls of our Victorian adventure in timeless creations from British handmade clothing brand, Twinkle & Me. 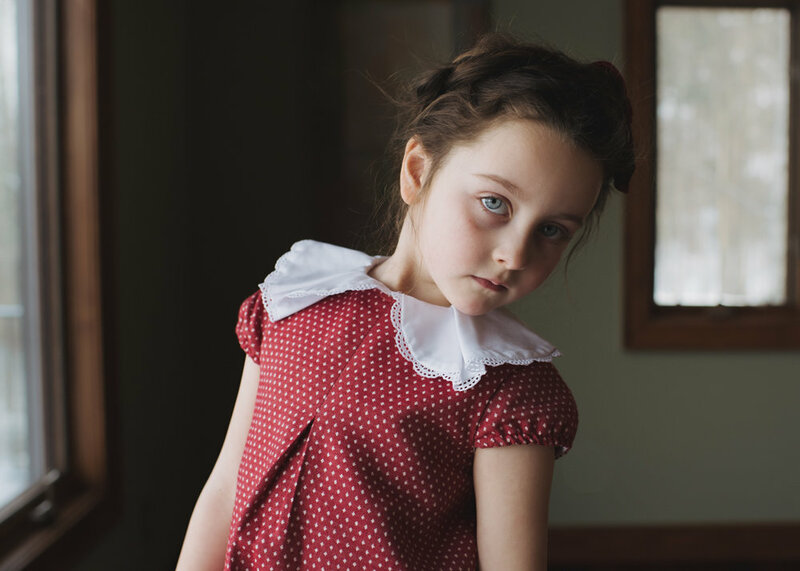 This beautiful line of childrenswear was inspired by a very special relationship between an Auntie and her niece. 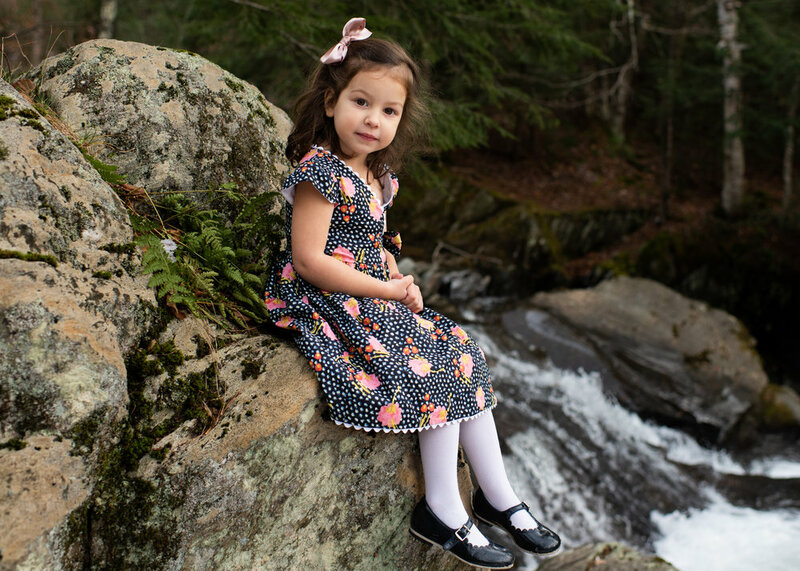 Custom creations were made for the little one which are now available to all in a range of fun prints and seasonless styles. Elise and Mila share their own special bond in the brand’s Imogen dress which has quickly become a staple piece in their wardrobe. From a selection of fun and inviting prints, we can customize this dress down to the sleeve length and back style. 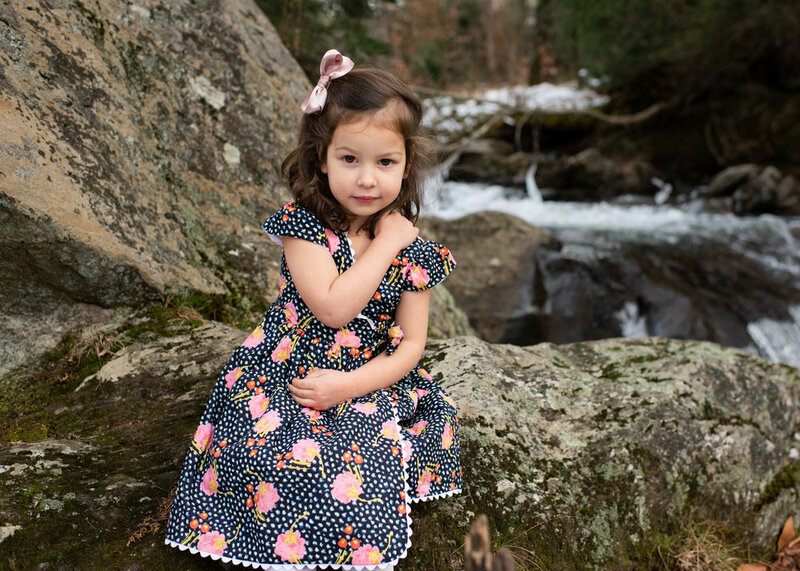 Our dresses feature a bow detail on the back, adding a touch of whimsy to these adorable pieces. Shop Twinkle & Me with 10% off when you use JNRSTYLE10. Shop the collection here. As the holidays approach, and our days are consumed with preparations and festivities, I’m on the lookout for ways we can simplify so to enjoy this season to its fullest. Without a doubt, keeping our little one’s wardrobe up to date is a burden I’d rather not have at the moment. To my delight, KidPix delivers perfectly styled head-to-toe looks that refresh our wardrobes and boost our spirits. Beautifully curated outfits are delivered to your door commitment-free in the frequency of your choosing. Each box is a wonderful surprise that won’t disappoint. It is, after all, like having your own personal stylist without the burden of a trip to the store. Scroll down to pick up a special code for 20% off your first KidPix box. From the comfort of our home, we immediately fell in love with our box of keepers. We often struggle with outfits that aren’t quite complete or missing a staple item such as tights. KidPix made our daily outings a breeze with the appropriate coverings for a put together look. But perhaps more than anything else, we loved trying different looks from high-quality brands that we’ve not seen elsewhere. 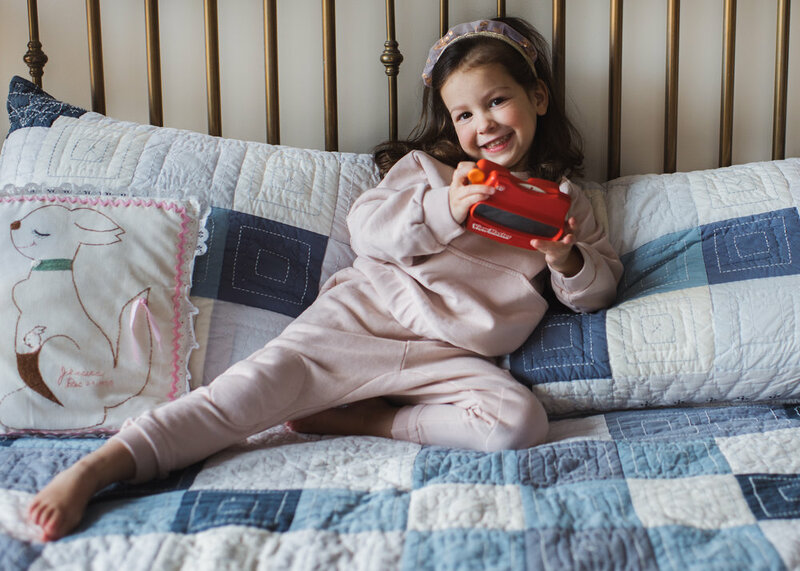 From the Irish luxury childrenswear brand, Cairenn Foy to the comfiest essentials by Little Borne, our hearts are happy and our days, perfectly styled by the talented team at KidPix. KidPix is offering 20% off your first order when using promo code FirstKidPix. Please note the 20% off voucher can be redeemed against your first KidPix box or towards a Christmas Box in the KidPix Christmas Shop. KidPix also hold weekly online pop-up shops where they introduce interesting independent brands to their customers and followers. To be kept up to date with their weekly events, follow @kid_pix on Instagram here. Winter has arrived in New England and a fresh coat of snow turns our backyard into a winter wonderland. There is a pause before the festivities that await and we wrap ourselves in the stillness of our landscape, dreaming of shining lights and sugar plum fairies. 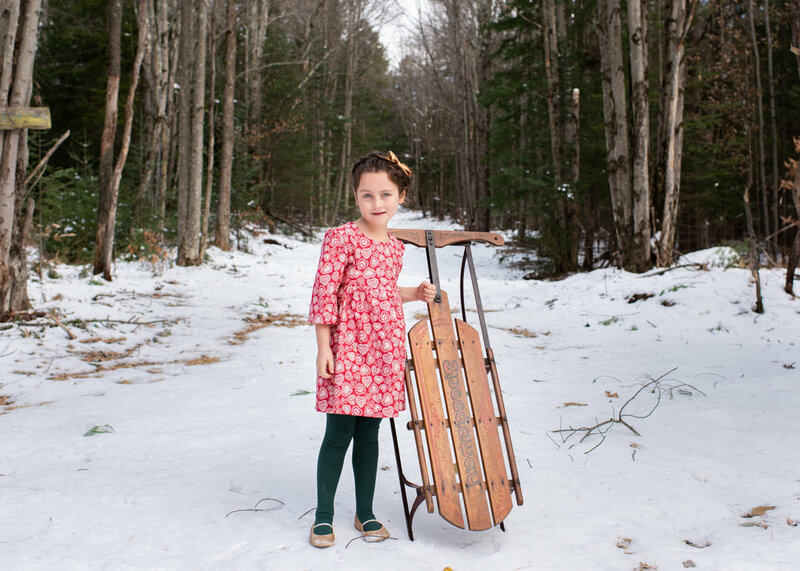 While we contemplate the rideability of our vintage sledge, Elise and Mila shine brighter than ever in British handmade children’s clothing line, Twinkle & Me. We cosy up to classic Nordic prints that Twinkle & Me has available through their made-to-order clothing line perfect for holiday giving. 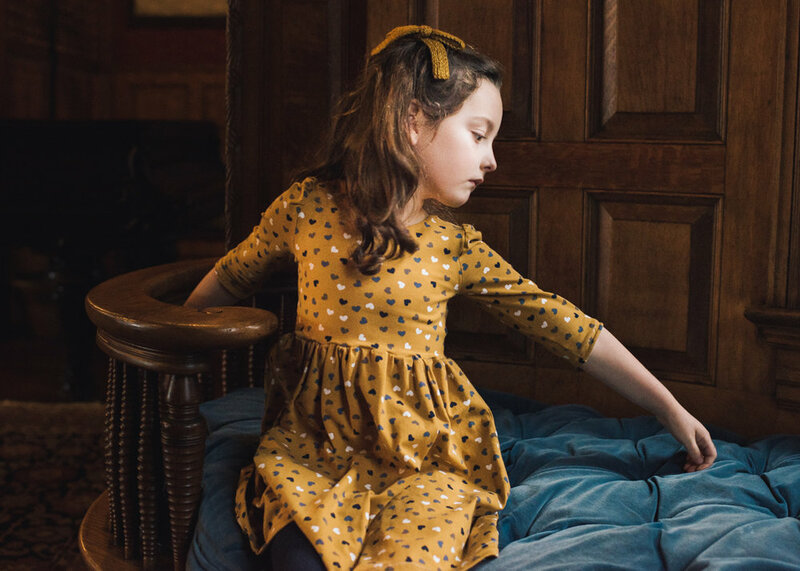 Customisable from the print selection to a range of dress styles, these one-of-a-kind pieces can be made to match the sparkling personality of any child. 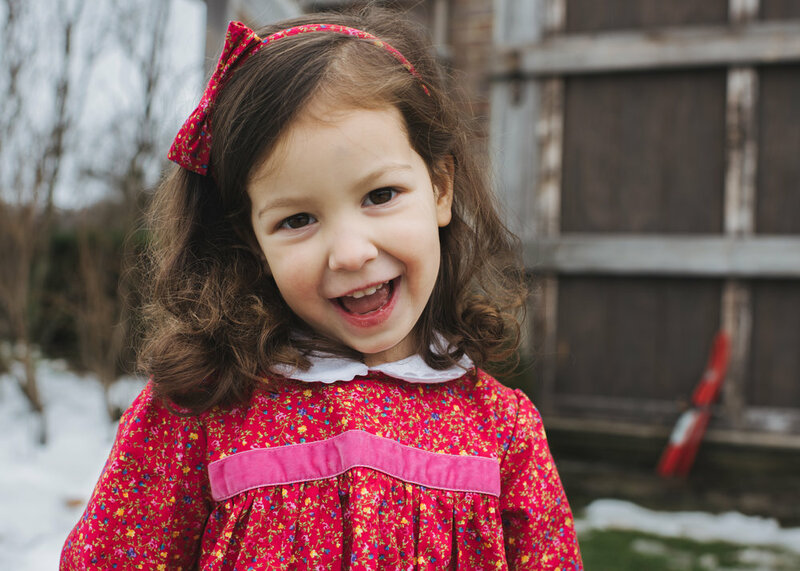 With an array of easy to wear pieces in fun seasonal prints, the design process is a breeze and so very fun with your little ones in mind. Elise dons the brand’s Catalina dress in a Nordic heart print while Mila shines brightly in the Maddie dress in grey Skandi fabric. 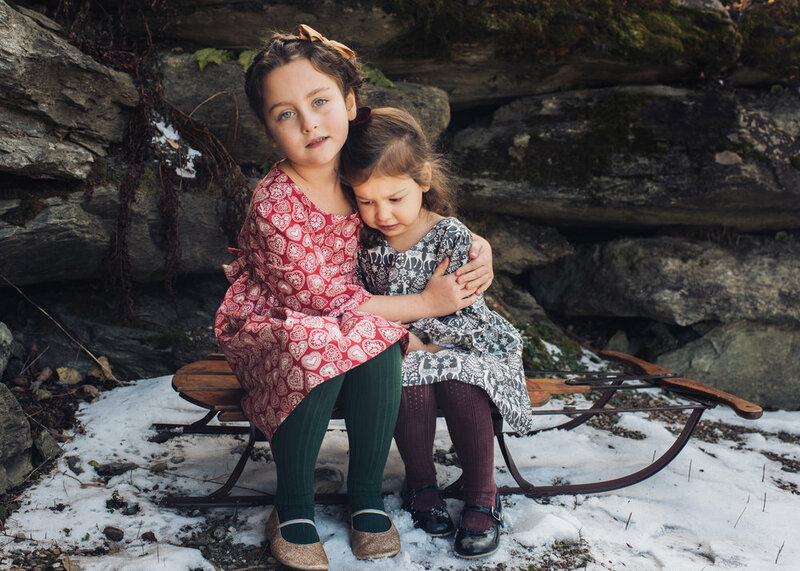 With winter at our doorstep, we’re already feeling festive in these darling pieces from this truly unique childrenswear brand. Visit Junior Style London for the full feature here. For most of my years, I’ve settled in New England, cursing our bitter winters and unpredictable weather. But these distinct seasons, however unpleasant at times, display a magnificent Autumn and Spring. A temperate fall day was the perfect persuasion to visit Old Sturbridge Village, a living history museum depicting life in 19th century New England. Stepping back in time, the girls try their hand at the Game of graces, an activity borrowed from early 19th century France, with two ribbon-clad hoops and dowels to send them air bound. While we didn’t quite master the game, the reinterpreted play was fun nonetheless. In the theme of French influence on our pastoral New England home, the girls travel effortlessly through the seasons in Charlotte sy Dimby, a timeless favourite. Pettiskirts, hand-smocking and covered buttons are graced by Charlotte sy Dimby’s signature back tie, adding to the elegance of these fine garments. Mila’s Princess Charlotte dress is the reincarnation of a dress worn by Her Royal Highness on her debut trip to Canada. Elise shines in the brand’s Constance dress. A chic style in a subtle blue textured fabric, it moves beautifully through endless adventures in our bucolic New England home. For the full post and more, please visit Junior Style London. Fall begins, and with it, our everyday shuffle becomes all the more demanding. While carefree adventures slowly recede, magical moments are scarce but still to be made. The warmth of our river valley coupled with steadily cooler nights drapes our mountain mornings in fog. Naturally, we find ourselves reaching for all the goodness of fall from two of our favourite brands, Tocoto Vintage, and Louise Misha. As the school year commences, closets are cleaned, making edits and trying on hand-me-downs. Space is made for a special piece or two. With their unique personalities in mind, the girls’ Father did some styling of his own to create fall-ready looks, perfect for cooler days ahead. 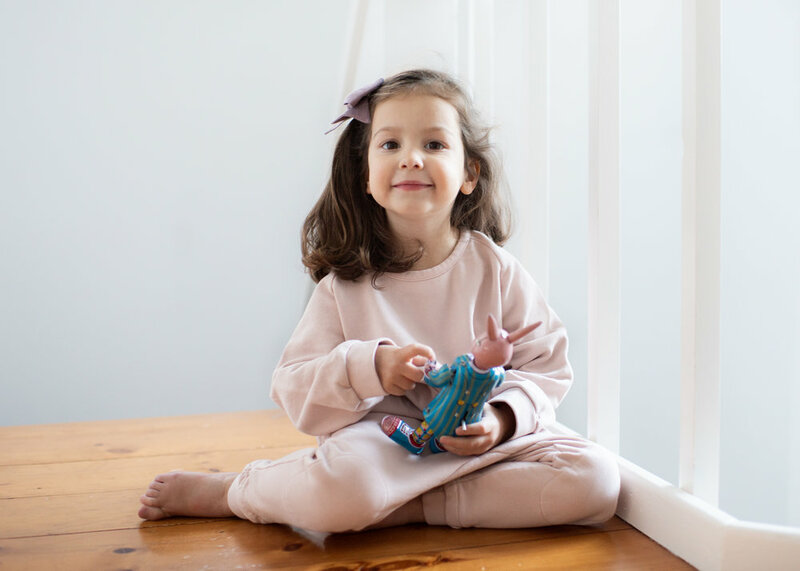 Presented with a broad selection from which to choose, he was drawn to styles from two children’s wear labels we’ve come to know well over the years; Spanish brand, Tocoto Vintage for Elise and French brand, Louise Misha for Mila. Tocoto Vintage makes its way into our closets and hearts year after year. Inspired by antique garments and patterns, the styles exude a delicate romanticism with fabrics that stand up to the modern day lives of our youth. The whimsy of Louise Misha is meanwhile a perfect compliment to Mila’s bohemian spirit. She delights in the details of her ensemble down to the most excellent shimmery socks. We invite you to view the complete post on Junior Style London here. Hong Kong-based brand, Velveteen, presents a selection of tasteful pieces that exude a playful spirit, matching our whimsy on this late summer’s day. I’m the least bit surprised Elise and Mila yearn to wear these delightful looks daily. What really makes this brand shine for me is their commitment to fair trade practices and the employment of female artisans who, in turn, are able to provide for the needs of their own children. The Carolina Dress, worn by Elise, is adorned with a gold studded waistband in a sheer dotted swiss fabric. Mila's Luna Dress features fringed details and sequins on the bodice. Worn with contrasting tights, we're eager to cozy up for fall in these beautiful styles. 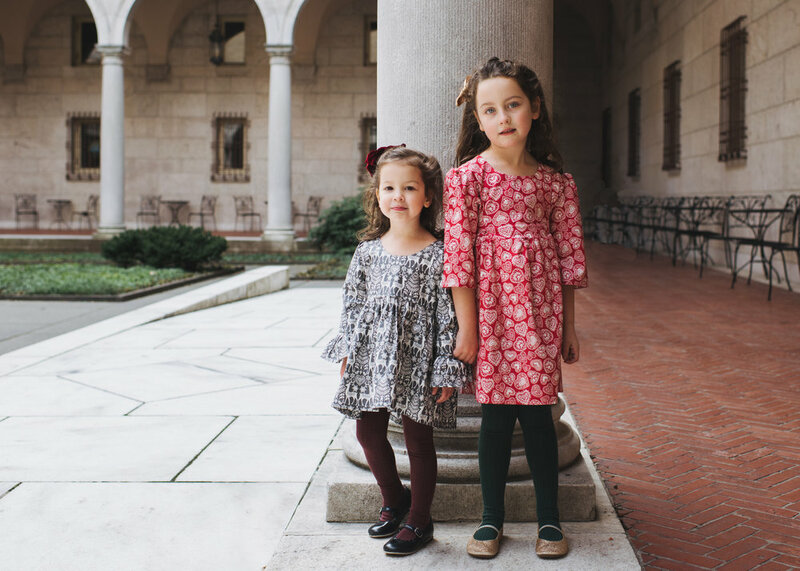 Elise and Mila’s dresses: Velveteen Clothing. Click here to view the collection. Photography Jessica Dickinson – All rights reserved. For the full feature, please visit Junior Style London. We recently travelled back to London where the weather Gods bestowed us with sun-filled days giving way to adventures in freshly manicured gardens. In this maze of hedges budding with new life, we planted ourselves for the day, filling our senses with Spring. Elise and Mila floated like petals in their new season Charlotte sy Dimby dresses, a perfect accompaniment on this fortuitous day. We’re no strangers to Charlotte sy Dimby, a brand hailing from France with roots in Madagascar. The allure of their handcrafted dresses has us spellbound season after season and their Spring 2018 collection is no exception. Hand-stitched smocking, petticoats, and elegant bows are enhanced by beautiful fabric selections in fanciful colours. Springtimes past and present evoke a desire to adventure, rediscover nature and fill our senses with all that is new. With any luck, we’ll be back again soon, perhaps dressed again in our perennial favourite, Charlotte sy Dimby. For the full post, please visit Junior Style London! New England is welcoming spring with a week-long forecast of rain while cherry blossoms are just about to give our street a burst of colour and delight. Signs of new life haven’t gone unnoticed by these nature-loving sleuths who find joy in the tiniest of plants and creatures. Our daily walks have us searching city landscapes for signs of nature’s annual awakening. Refreshing our senses, we opt for beautiful flowing silhouettes from the Spanish brand, Popelin. Shades of terracotta abound at this botanical centre from the pots lining our walkways to the twirling dresses of my garden nymphs. Popelin’s founder, Cristina Sánchez, evokes a simple elegance through her use of textile and design. From the sourcing of materials to the manufacturing process, each garment is made entirely in Spain. With every turn of the cloth, details speak for themselves. Fabrics are thoughtfully chosen and feel just as wonderful on as they appear. Drawing inspiration from the Mediterranian, Sánchez has created a collection of earthy tones that has us dreaming of ocean sunsets and sunkissed skin. Elise and Mila continue their quest for flowering buds and noisy hatchlings while dancing away like garden fairies in hopes of showering their own little magic on all that grows. 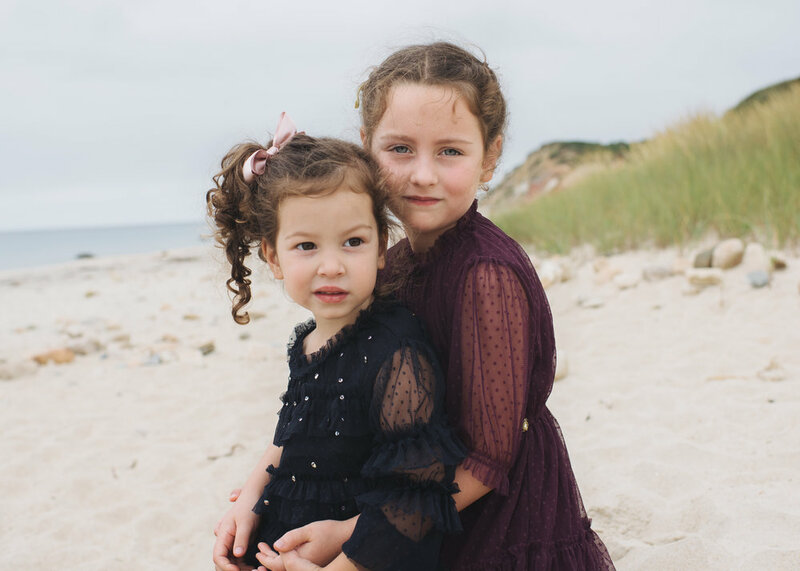 Elise and Mila’s dresses: Popelin, shop the brand here. Please visit Junior Style London for the full feature. See you there! A long-awaited trip south to the Belizian jungle gave us a short respite from all things cold and slushy up north and rejuvenated even the smallest of our clan. Last week, we found ourselves deep in the rainforest enjoying the company of songbirds, crickets and each other. 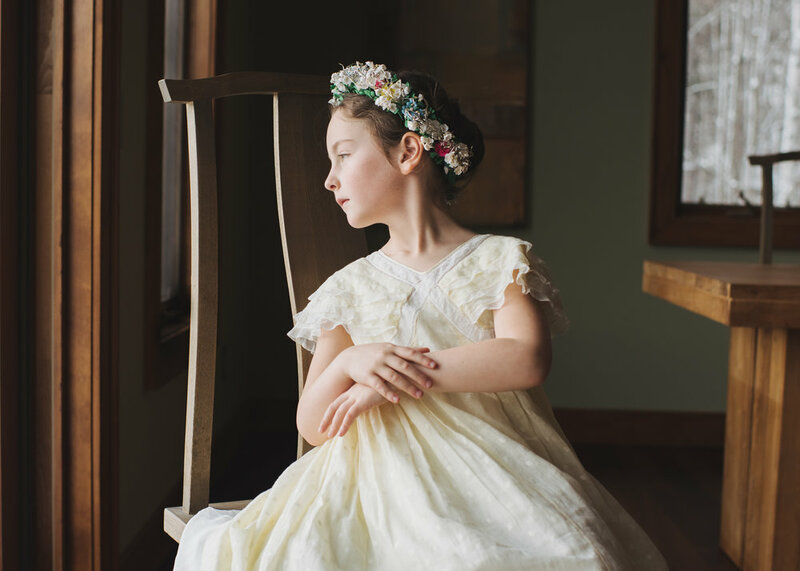 Our days were spent shroud in the comfort of Maison Balena and adorned by the whimsy of Everbloom Studio. Always looking for ways to pack light, I was pleased to find Maison Balena’s wonderfully soft and featherweight kaftans and sets which were worn daily for a variety of active (and relaxing) pursuits, keeping us cool and protected from the sun and mosquitoes (of which there were many). Worn morning to night, they doubled as sleepwear to boot. Even I got to partake in the excellence that is Balena! 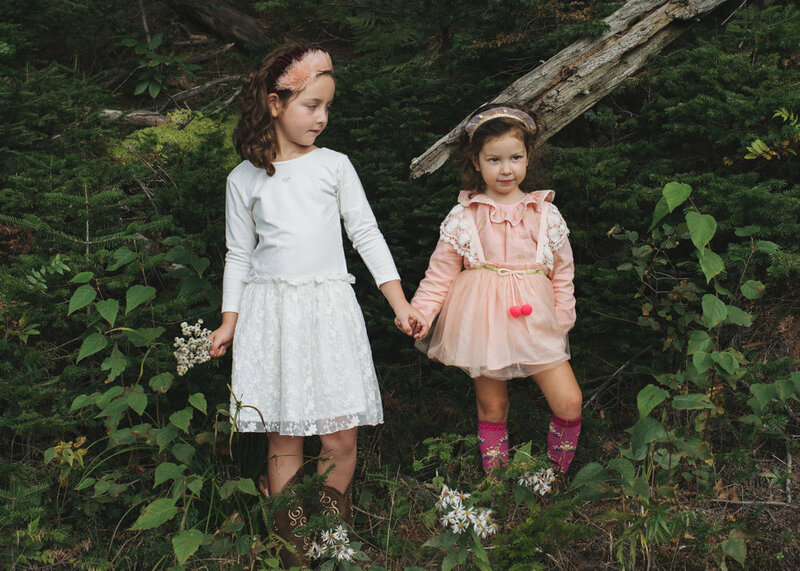 The girls delighted in the whimsical designs of Everbloom Studio, an accessory brand that understands the needs of aspiring princesses and entomologists alike with their crown headbands and dragonfly adornments. 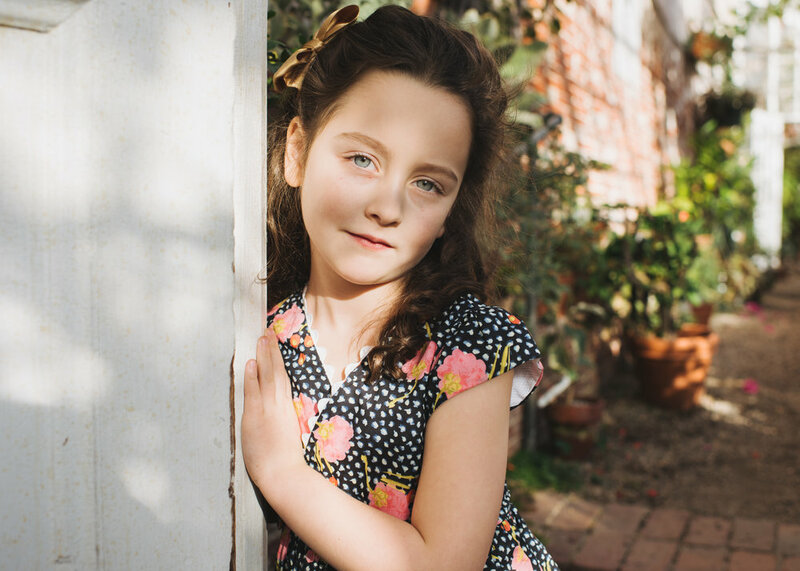 Join us on Junior Style London for our latest post featuring La Coqueta Kids. As we begin upon another year, our outlook is fresh and mind uncluttered and there is a sense of renewal as we let go and look forward. While I don't tend to make resolutions, I aim to stay mindful of our passions and indulge ourselves in them, however that may play out. For the girls, on a chilly winter day, this translates to an afternoon spent dancing to Pink Martini (the lone disc in our CD player). 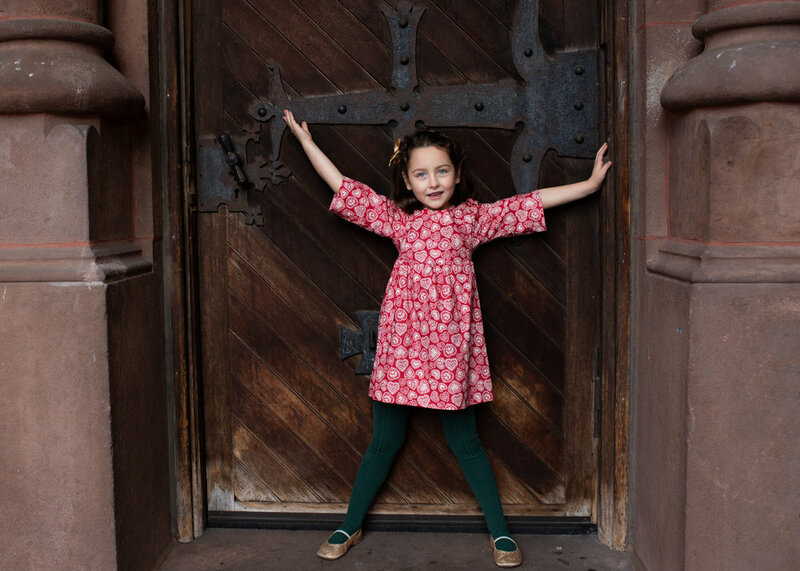 Thankfully, they share my affinity for Spanish childrenswear brand La Coqueta Kids, and are in their element as they play. While Elise and Mila go about dancing, I'm fascinated by every movement and the personalities exhibited in their fantasy worlds. Often times, I join them but it is equally as rewarding to watch. Matching dresses from a brand we've long revered has me smitten. These gorgeous pieces are fully lined and perfectly finished with stark white collars that add a touch of elegance and demure beauty which encapsulates this brand. Elise's Carmin Dress is the perfect transitional piece sure to follow us through seasons and generations of wear. We first discovered this London-based brand while overseas and made a point to visit their Hampstead boutique, filled with a rainbow of knee-high socks, bows, and mary janes, it is a dream for one-stop shopping and outfit assembly. With a newly opened second location in the heart of Notting Hill, our journey to La Coqueta's world of Spanish-made goodness just got a bit closer (although a trip to Hampstead is always a welcome departure). 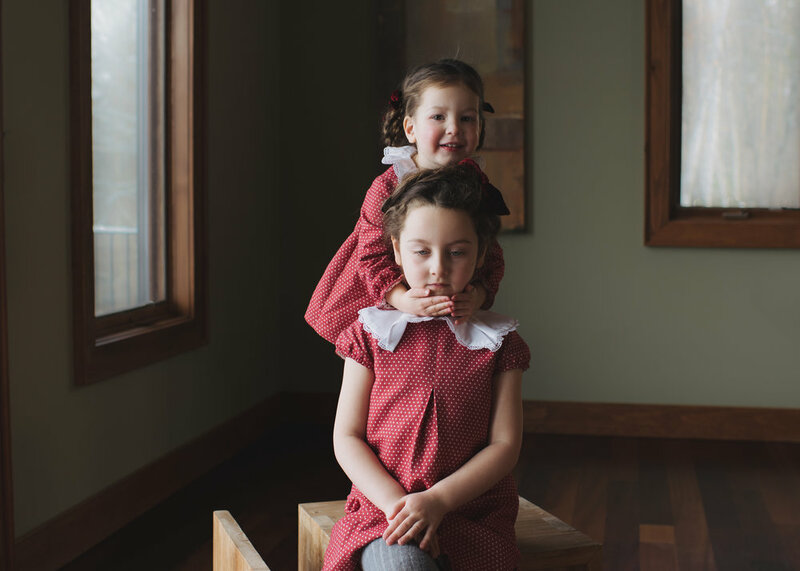 Elise and Mila's dresses: La Coqueta Kids click here to visit the online store. Elise and Mila’s hair accessories: Wunderkin Co.
Be sure to check out our latest post on Junior Style London featuring French brand Charlotte sy Dimby. Link here. As we approach another year-end and the festivities that await, we retrace familiar steps that lead us back to my childhood home. Much like the calm before a storm, everything here is serene and our minds at ease. Once pampered and feeling refreshed, we're ready to tackle the holidays with a bit more glee. The brilliant collection from Charlotte sy Dimby brings us even closer to that festive feeling with a gorgeous selection of holiday dressing that has us spellbound. And truthfully, there is no time like the present to add a bit more fancy to your day. As we stand watch at the shoreline, an early December breeze gives movement to hemlines and hair ties. The girls engage in a Regency style dance, evoked in part by the classic styles of Charlotte sy Dimby. The incredible detail on Mila's Smocked Poule Dress lends itself to the season. Made with the most luxurious winter cotton, it feels wonderful to the touch and impossible to resist wearing daily. Like Mila, Elise's Smocked Dress carries with it a signature handmade quality that folks have come to know as Charlotte sy Dimby. A now international brand, these beautifully handcrafted garments have a rich history with smocking pioneer, Monique Ramahay. Local to Paris's 6th arrondissement, Monique's flagship boutique, L' Île aux Fées, is an institution in its own right. 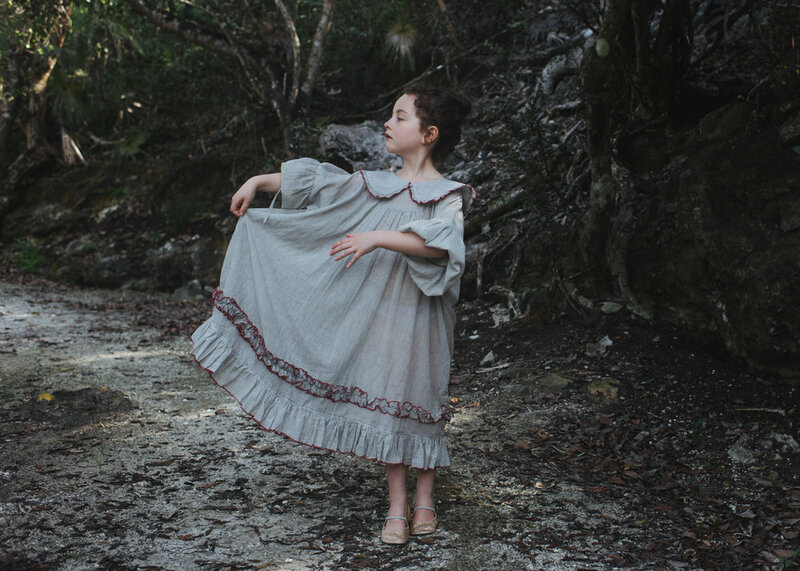 Covered buttons, handsewn hemlines, and handmade petticoats are just a few of the reasons we adore the elegant childrenswear label, Charlotte sy Dimby. And visit Devon's Drawer to shop the latest collection with 15% off here. Use code BBLAKEACRES15 for 15% off your order. (Code expires midnight, Wednesday 8/11/17). Wherever we may roam, the mountains call us home. There is something magical that exists only here, brought in part by the serenity and enchantment found along cliffside passages. Where the terrain changes with elevation, peeking our interest and inviting us to explore what lies ahead. These steps are familiar yet thrilling and we feel at home within the protective walls of nature. In this moment, our universe is filled with wholesome adventure and a bit of heirloom goodness from Devon's Drawer. Woven into each piece from Devon's Drawer is a dedication to ethical production and quality fabrics with unmatched standards. These garments are as natural as our landscape and withstand the type of play that comes about on (or off) trail. 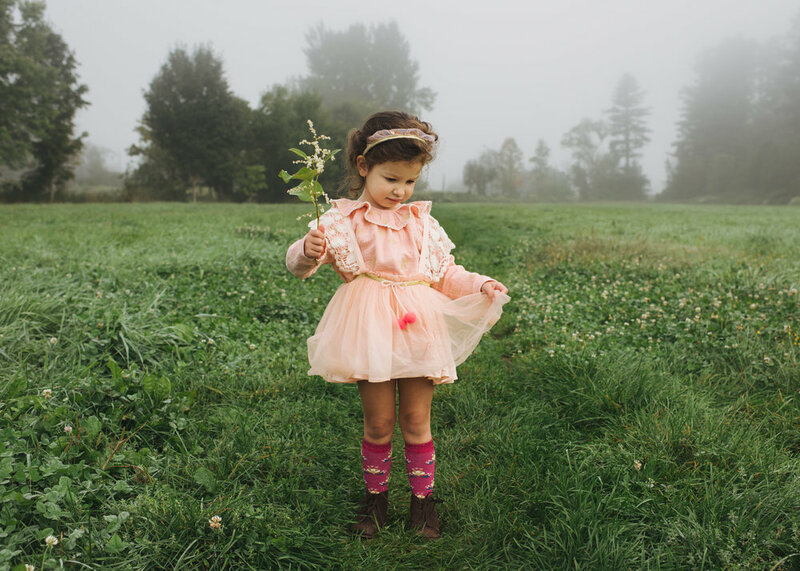 Soft pockets on Elise's Hillary dress are perfect for collecting a colourful array of leaves and fairy moss. The length adds a modern touch and provides ease of wear. With little hesitation, Mila forges her own path in the brand's Aline overalls and Russell turtleneck, a combo too cute for words. Our mountains are now topped with a new dusting of snow and they're calling us back for another adventure along their slopes. Elise & Mila’s outfits: Devon's Drawer. Shop the latest collection here. We welcome you to read the full post here on Junior Style London. The time is now for walks through the overgrowth of summer's end. As one season passes, another is in full swing with burgeoning chipmunks and falling leaves. Our presence along this journey goes unnoticed by the activity that surrounds. Elise and Mila layer up in pretty pastel knits from Blue Alma, a brand hailing from Brooklyn with roots in Germany. Designer Annemarie Shoemaker's delightful collection of year-round knitwear is reason alone to venture outdoors on a brisk fall day. Blue Alma's AW17 collection is a bouquet of soft pastels in blush, sage, and cream with limitless possibilities for styling the perfect fall wardrobe. The A-line shaping of Elise's Emma tunic swings with ease and uncompromised comfort while Mila's Marlow vest has quickly become a staple piece as the days grow shorter. Pointelle yoke collars and cable knit details add a touch of prim to these classic silhouettes. Time stands still as we wander along the well-trodden paths near our home. Winter looms in the not too distant future but for now, I can smell the fall air and hear the scurry of chipmunks and I'm happily content in the presence of our changing season. While autumn patiently waits, we relish the splendor of high summer. A colourful finale of blooms tickle our senses and tepid waters invite us to play. Delights of the season abound and there doesn’t seem to be an end in sight. With summer lingering longer, our favourite pieces from the alluring brand Maman & Moi transition beautifully into smart back-to-school attire. maman&moi transition beautifully into smart back-to-school attire. A brand celebrating the unique bond between mother and daughter, maman&moi exudes elegance with every detail. This charming collection sends our hearts aflutter with Liberty fabrics and the finest finishes. 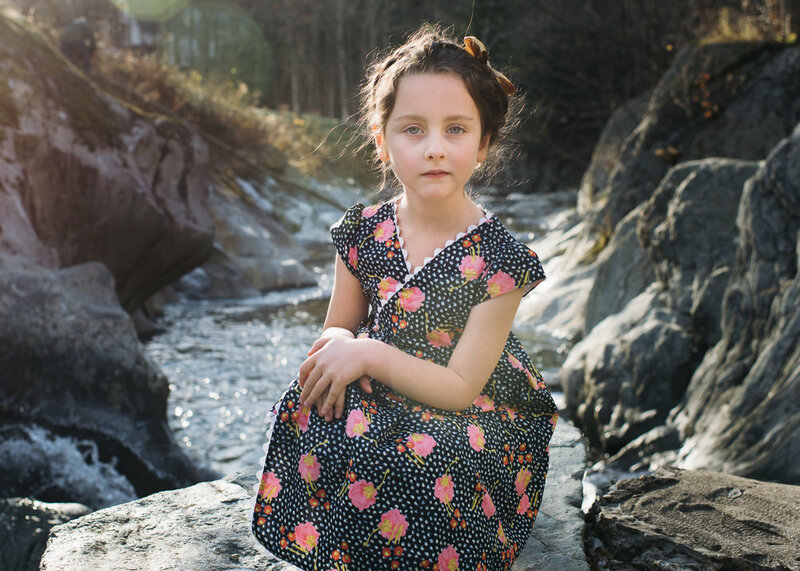 Daughters likewise feel at ease in the comfort of these dresses that wear beautifully from one adventure to the next. Owner and designer, Allegra Richdale, has named each piece in her collection after a special someone in her life. Elise wears the Tessa dress, a reversible frock in red and white gingham while Mila is garden-ready in the Violet with its pique petal collar. As we saunter through the last days of summer, you may very well find us at play in maman&moi, making beautiful memories that are sure to linger longer than our endless New England summer. Elise's hair accessories: Wunderkin Co.
Everything old is new again. For us, this often rings true upon discovering a vintage gem that finds new life in our wardrobes. Handcrafted garments from decades past satisfy cravings for one-of-a-kind pieces with timeless appeal. There is a world of vintage and antique childrenswear that awaits discovery and repurpose but knowing where to look is often key. Elise's Depression-era netting dress is one of many treasures you'll find in Mary Beth Hale's scrupulous collection of vintage apparel. 'In with the old' I say! These vintage treasures find us immersed in nostalgia. 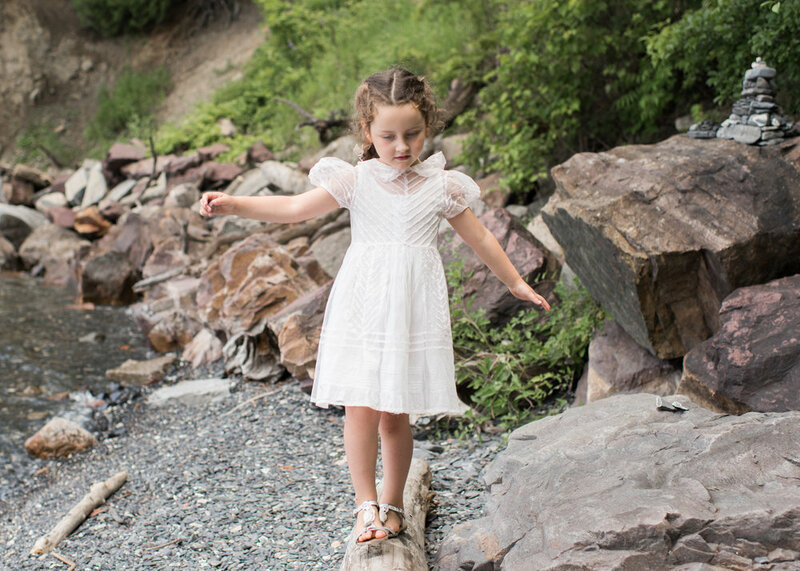 We're transported to simpler times, wading barefoot along the banks of Lake Champlain. A hunt to find perfectly shaped shale ensues and we try our hand (rather unsuccessfully) at skipping stones along the water's edge. I'm left to wonder if these garments could talk, might they tell a similar story? One thing I'm certain, Mila's dress may actually hold such memories from my own childhood. My Mother diligently cared for and saved a wonderful collection of clothing, now sprinkled throughout the girls' wardrobes. Thankfully we don't need to scour store racks or attics to find pieces like these. 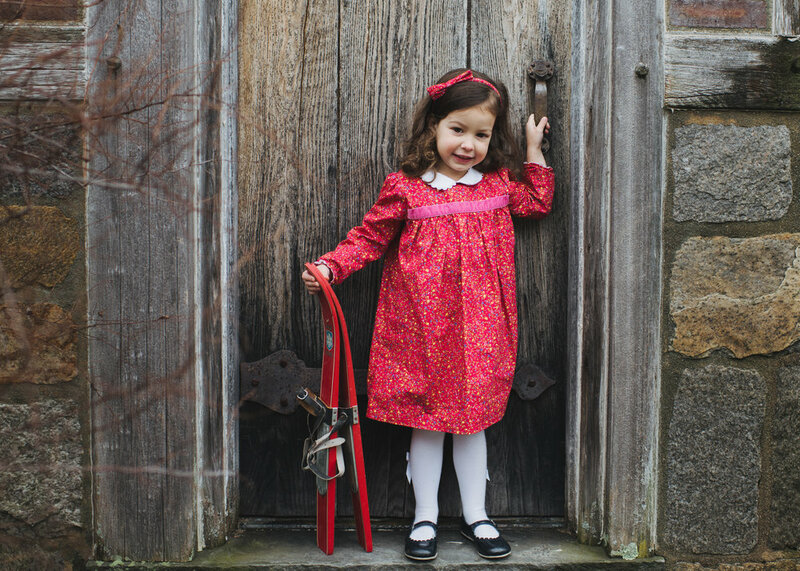 Mary Beth Hale has done the work for us with a stunning collection of unique and pristine childrenswear from the past century and beyond. From hand embroidered baby bonnets to velvet rompers and fur slippers, I can assure you, it won't be easy to browse without temptation. But if you simply must, she's offering readers 10% off at purchase with the code BlakeAcres.